It was more than just a benevolent monsoon that was lashing most parts of coastal and northern Kerala this 2018 – the worst flooding in 92 years, partly due to rampant construction that was destroying the Nilgiri biosphere. Entire villages vanquished, townships trodden down, schools submerged: life that we humans knew came to a complete stand-still in many parts of Kerala. Social Media was on hyper-drive with countless people sharing countless stories with nano-second updates on progress, stories of devastation, sacrifices of heroes. Cries for help – any kind of help – help with food, help with supplies, help with physical labour, help with re-building. And then stories of mis-management of donations. What to donate, to whom, how & when. All so great – isn’t it? The problem with these seemed the donor didn’t know how the money or supplies were routed. The stories of mis-handling & misappropriation made it even more important for Whitefield Rising to make sure of both the what and the how. 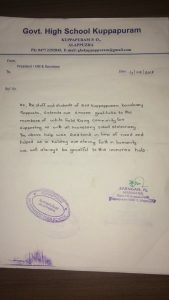 Deepthy a resident of Thubarahalli and fellow Community member spoke of the tragedy of the government school in Kuppapuram, sufficient research was done to validate it. Yes the school was fully submerged and nothing stood apart from the building itself. It was a total shut-down and they couldn’t re-open until it was restored back. Deepthy’s own sister was a teacher there – so first hand info. This seemed like the opportunity that was perfect for Whitefield Rising to create joy. Once verified, the Communities Connect group, rapidly swung into action – A draft plan was drawn up and shared within a smaller group for quick verification – the list of asks from the school vetted through Deepthy, a POC from each participating community, and co-ordinators for the drive. Once the draft was good to go, Nitya posted it on the Communities Whatsapp Group. The list of asks about 30+ materials starting from pencils to erasers to umbrellas to bedsheets in sizeable quantities to support a school of 180. Within minutes of posting the messages, the various members picked stuff they’d own and donate – either through their apartment or individually! Rishita, Yagna, Vidya, Sampa, Juhi, Sreekala, Bonitaa, Shailaja outdid one another in picking the items. Yagna and Rishita worked with identifying good quality providers at bulk pricing – while it was important to get good value, quality was paramount. And Devyani kept a tightly updated register with call-outs on what was covered and what was pending. After 3 days, and hundreds of whatsapp messages, only umbrellas were left to be sourced! Nitya chipped in from her community & Sandhya Rao fulfilled some more. When one was unable to drop off the stuff, someone else willingly drove to pick it up! They were packed and delivered directly to Deepthy’s residence & she kept the group notified – every message full of gratitude. To ensure safety of the goods, the teachers would themselves land in Bangalore and all the packed stuff would be driven in a manned truck. Like clock-work everything reached the pick up point before Aug 31st. Thoughtfully scripted and beautifully executed. It was a fitting finale on Teacher’s Day, when the teachers from this little Govt School from a hamlet called Kuppapuram left back to their village – with the truck ready to leave, to get their school up and running . 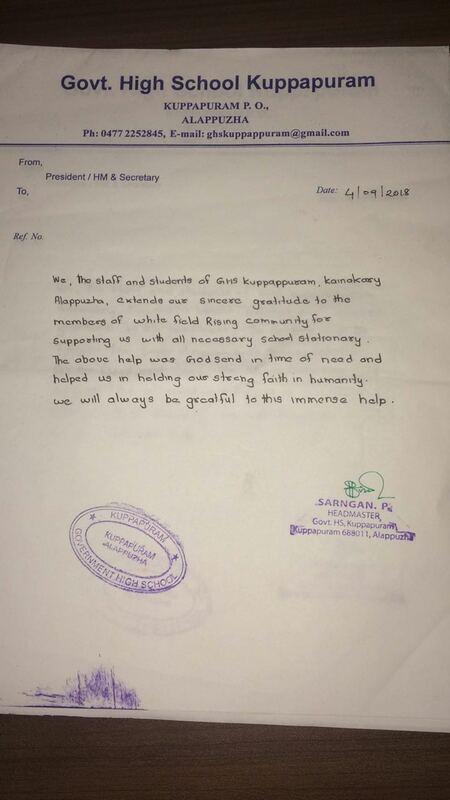 On Teacher’s Day of 2018, Whitefield Rising with more than 10+ participating communities in Whitefield, spread illimitable joy among both the teachers & students of Kuppapuram!